When the frost days came around in late Falls, many friends on my social media page suddenly became a professional meteorologist whose sole devoted prediction was “Brace yourself, Winter is coming!!!”. Somehow they always get it correctly every.single.year. Yet society still panic every time and a series of unfortunate events repeatedly ensues. 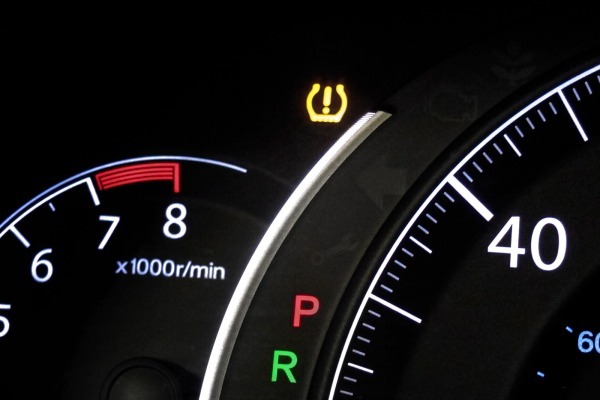 First, their car dashboard suddenly shows an empty food bowl warning light out of nowhere, an indication that food is running scarce and hunger will linger on for several months. So the supermarket checkout line begins growing, wrapping around the store and then around the corner of the street, all behind a lady with a can-I-speak-to-the-manager haircut who demands to speak to a manager because her 3rd coupon didn’t go through and clearly the cucumber was advertised for $1.29 instead of $1.35. 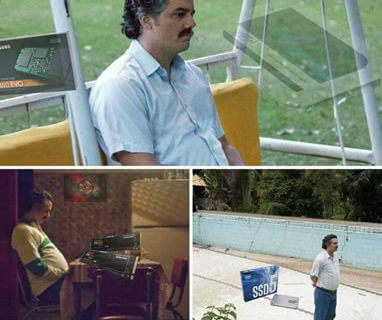 Then once the first special snowflake lands, things immediately get worse. 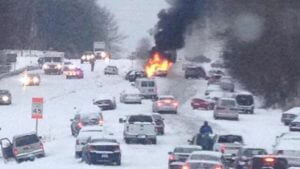 Because these white stuffs, even at 0.1″ of accumulation, have the power to hallucinate an already troubled mind; make it completely lose the ability to drive properly on the highway without causing colossal collateral accidents with maximum damage. Or maybe someone didn’t check the tire pressure earlier. I don’t know. 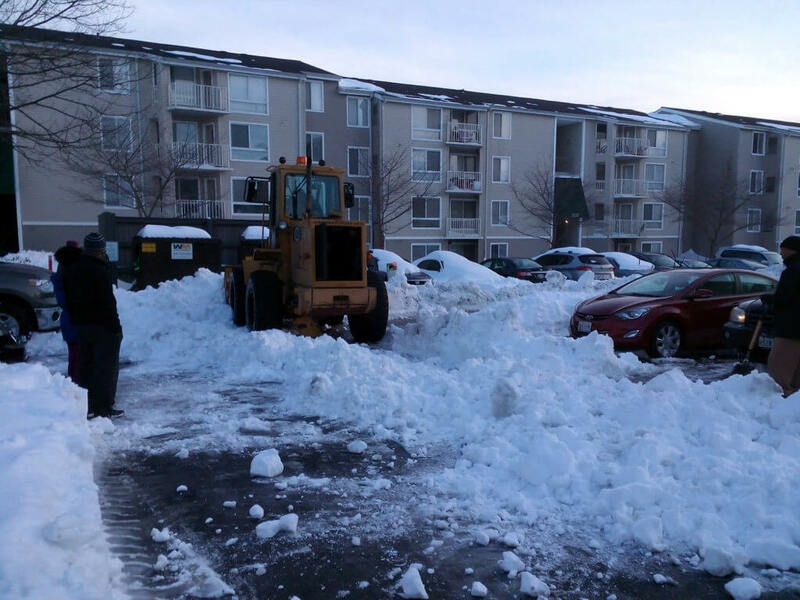 But I do remember a snowstorm in 2016 that it filled up my apartment complex’s roads all the way to the level of my grandma’s recently replaced hip (sponsored by by Rand Enterprises). 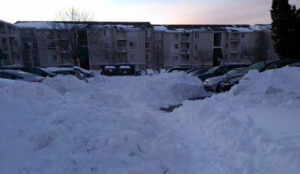 And two days later, a wheel dozer was called in to clear the street because people couldn’t dig their way our to go to work and the maintenance team consisted of 2 old guys, couldn’t get their gas snowblowers to start even if their 401k entirely depends on it. Now because the snow was left in the sub-freezing for too long it turned into heavy, hardened blocks of ice. So unfortunately for the kind yet clueless gentleman who drove the dozer as he forgot to factor in that condition, he managed to break the dozer right on the first run. Approximately 2 minutes into the only one job he had. Dozer overheated itself, then blew the transmission and eventually stuck at a busy corner. So we had frozen boulders all over the place at knee-high and a stuck dozer at tree-high, all the guys had a good laugh. They couldn’t go to work for five days, spent all day with a few beers and a lot of shoveling. All around, great times. It actually helped build a strong and caring community. But everybody received an eviction notice at the end of the month though, because they missed so many days at work and didn’t make enough to pay rent. Fortunately, the apartment managers sat down together like the mighty council of Elrond and got approved to extend the due date for the tenants. Because they truly deeply sympathized with the current situation; and after all also because two of the managers lived here and were late on rent, too. So all around, great times. Such a season of love, Angel Schunard would have been in tears. Fast-forward to the present day, now that I have my own small driveway I can no longer rely on old broken gas snowblower and stuck wheel dozer. I realize that it’s about time to be a member of the Nightwatch and preps myself accordingly. So I promptly set out to buy a few six-packs of beer every time the weather is trying to snow. It should last me at least 36 hours into the storm. Unfortunately that didn’t seem enough for the real world. Thus I had to find the best battery-powered snow blowers to clear my driveway the most efficient way so I can get back to the beer work… before I no longer have a driveway to clear due to unpaid mortgage. I hope you will find my research and testing helpful and don’t forget you have the ability to comment at the end of the article for great respect and great responsibilities. And for that reason, DO NOT repost “Winter is coming”. 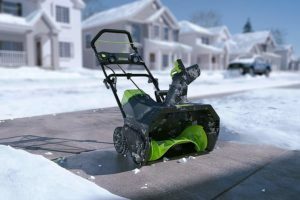 There are only a handful of battery-powered snow blowers in the market right now, because it’s relatively a new thing and it certainly will be a little while longer before these green machines could really catch up with the dirty ol’ gas-powered snow blowers. Old school snow blowers have so much more torque power, clear out a huge volume of snow effortlessly but they are super noisy, weighs over 250lbs, releases ton of toxic air, and requires attentive maintenance. Yep, ask the repair crew at my former apartment complex who didn’t do any of that. 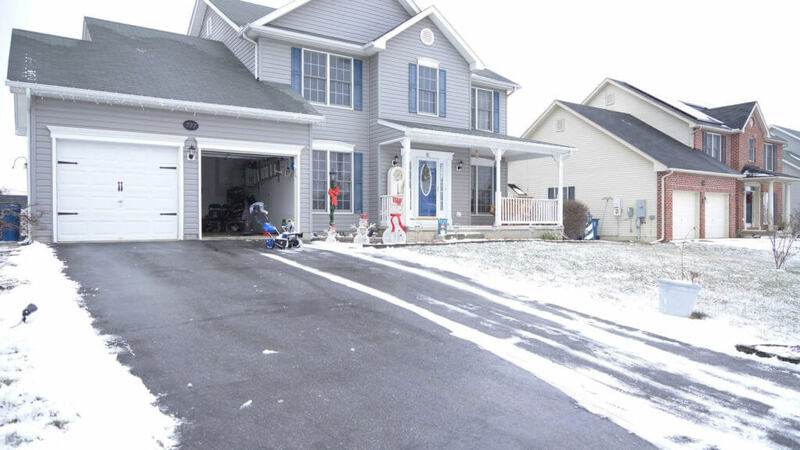 Plus, it’s usually overkill for light to moderate snow and a short driveway. The fumes alone would make you smell like you are about to be invaded by the USA freedom & liberty after the second pass down the sidewalk. On the other side of the portal, we have these more compact, light-weight and green energy, battery-powered snow blowers for a smaller everyday plow job. First, we don’t have to deal with the chore of buying gas which often ends up with arson charge (speaking from experience) and changing engine oil every now which then often ends up with food poisoning. But the trade off is these machines often lack the power needed to remove heavy and wet snow or snow that’s been sitting idle for more than a day or two in sub-freezing temperature. But heck, even a giant wheel dozer lost a battle against them so I didn’t set the bar very high to begin with. Which brings me to this enlightenment: most of the negative reviews online are from folks who did not have the right expectations for these machines. 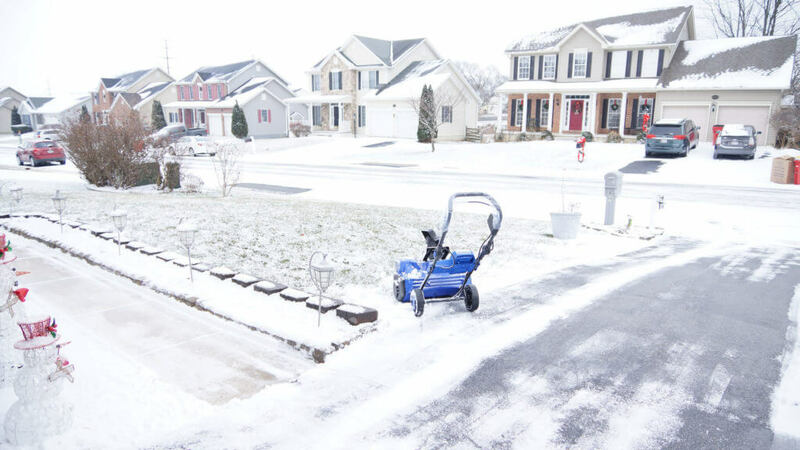 So the question is, if you wake up half alive in a dead cold morning and the snow has covered 3-8″ of your 2-car garage driveway, would you rather take a battery-powered snowblower out and quickly start clearing up the mess in 30 minutes, or spend 30 minutes trying to fill up the tank of a gas-powered snowblower (if you didn’t forget to buy gasoline before hand) and hope it’ll crank successfully before your bicep gives out? …Still trying to dig my car out boss, I might not be able to make it today but if I could that’s gonna be several hours late. Personally and honestly, I might do option C and just wait until it all melt while secretly praying that I won’t get fired when the sun shines again. However I’d take a battery-powered snow blower out in a heartbeat, have things done in half an hour and still got time to enjoy my morning coffee. Like how Luke Cage likes his coffee #ifYouKnowWhatImean. But in reality everyone deserves an unplanned, rebel break from work once in a while, so I took the liberty to capture multiple angles of the snowstorm in 2016 for future absence excuses. And it was the best thing ever –especially in an email to your employer. Feel free to use the snowpocalypse picture over there. This kind of off day feels a lot better than you normal weekly days off because the secret ingredient is crime. 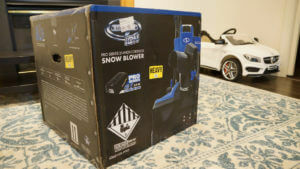 Now these are the 4 snow blowers we will be looking at in today Tiny Review. 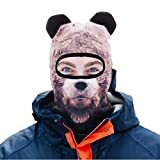 Also here’s a realistic animal face ski mask that you should wear when tackling this snow removal job, because +5str +3hp +4def. Light-weight. 500W motor plows up to 450 pounds of snow per minute. Easy fold. Plows up to 1500 pounds of snow per minute. 2500W motor plows up to 1000 pounds of snow per minute. Equipped with knobby rubber tires and comes with chute cleaning tool. 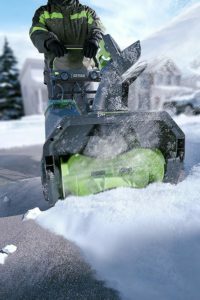 Of the four blowers we are comparing today, the Greenworks Pro 80V Snow Blower comes with the top of the line, if not the best, 80V lithium-ion battery tech. The higher voltage battery allows Greenworks to reduce its amperage in order to bring the charge time down to just only a 30-minute wait. This model comes with 80V 2.5A battery that will last up to 40 minutes, that is a decent amount of runtime to clear out moderate snow cover (less than 10″) on a typical 40ft long x 20ft wide driveway. 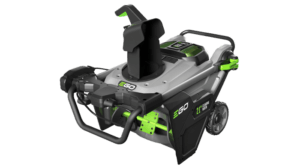 In comparison to the Snow Joe iON18SB that comes with 40V 4.0A battery which takes over 3 hour for recharge and has a runtime up to 50 minutes, the Greenworks PRO 80V Snow Blower wins hands down in the enegery source department. Wonder when someone’s gonna come up with an arc reactor so we can plow the whole neighborhood and be rich. But anyway, the Greenwork model here is still a bit more expensive than Snow Joe iON18SB, so it’ll be a tough decision if your budget doesn’t draw parallel with your wife’s happiness or intersects with this month survival needs. On a lesser note, one thing that you’ll find most people and me along are greatly concerned about this Greenworks snow blower is its 20-inch plastic auger blade. Though it is made of very strong and thick plastic material, it is universally considered to be a consumable component and there will be a time when it’s going to chip, crack and snaps into ashes. Maybe not the last part. But you will have to replace it soon or later in the future. 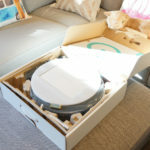 Greenworks customer service should be able to take care of this issue without much hassle under normal use condition, since the warranty goes way up to 4 years. A lot of people I know had pretty good experience after a few phone calls, some got their whole unit replaced or defective battery exchanged at no cost. Those who come from a gas version of these snow blowers, you probably won’t find a lot excitement working with the Greenworks Snow Blower –but that generally applies to all battery-powered snow blowers hereon. If you expect to plow less than 13″ of snow in a relatively small area and still come out smell like a rose after all, this probably meets your needs. But if you are hoping to plow snow off your cabin in the wood’s driveway that has the same distance as the Shire to Mordor, you might be living in the wrong location or looking at the wrong weapon. You’ll need the Ring of fire to melt ’em snow efficiently and violently. 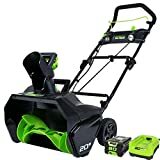 The Snow Joe iON18SB is a bit more bulky than Greenworks PRO 80V’s above, yet its clearing width is actually 2-inches shorter, only at 18″ max. As the result, it is 1lbs lighter than the competitor and ideal for smaller task. 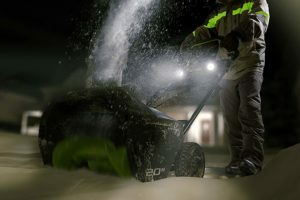 Now here’s a good part: it is normally a lot less expensive than the other battery-powered snow blowers and it works just as well. This little big guy has no trouble attacking 12″ of snow but anything more than that, you may have to come back several passes to get the job well done. On the other hand, the Lithium-ION 40V 4A battery comes with this model seems to last forever. We occasionally find it goes beyond the 50-minute mark upon continuous light use. The battery also fits the Cordless Pressure Washer we did a video for last winter, so it is a bonus to have an additional battery that you can share between both machines when needed. 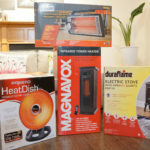 This might also be an important factor when you are out and about shopping for a portable electric snow blowers, since marrying the same brand for its line of products usually saves a lot money than buying just the new battery alone for whatever machines you already have. 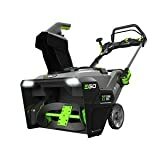 The Snow Joe iON18SB has a similar rubber-blade and partial steel auger design like the EGO Power+ snow blower below, but its 500W motor feels a lot less powerful than the more expensive EGO machine. In comparison, it can move at most 450lbs of snow per minute while the EGO Power+ could do nearly over 1500lbs of snow in the same amount of time. Surprisingly, the Snow Joe iON18SB does a very good job on one of CPG editors’ light snow covered driveway. It took a little more than 15 minutes to finish a 750-sqft driveway without breaking a sweat. However, it gradually shows struggle when the snow is super wet or densely packed. We also find this kind of snow gets clogged quite often in the chute and causes the machine to shutdown to prevent overheat. Here’s a great tip: spray the cheapest cooking oil you could find in this area and that issue will happen a lot less often. Snow Joe iON18SB has a special twin called the iON18SB-HYB, a.k.a Hybrid iON18SB. 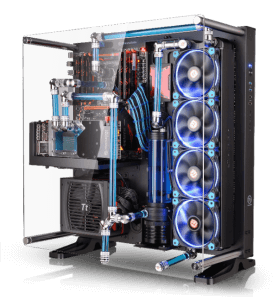 Same specs, same design, same look but this machine can also run off a 13.5 amp power cord after the 40V battery exhausted. When plugged in, the same 500W motor suddenly gives you a little more torque to dig through the snow much faster. Only if you don’t mind dragging a cable around. The ION8024-XR is like the prime age version of the iON18SB above who suddenly decides to become a gym-bro. This thing is badass and weighs over 100lbs; yet it is still not as heavy as a 250lbs gas-engine snow blower. So that’s something.. 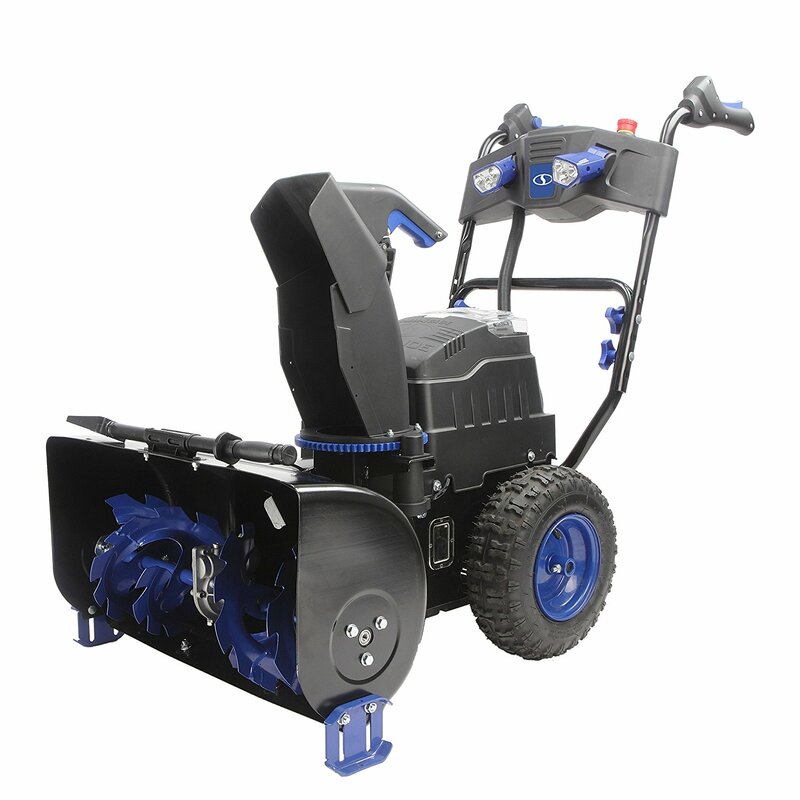 The ION8024-XR is a dual-stage snow blower with power-assisted wheels. 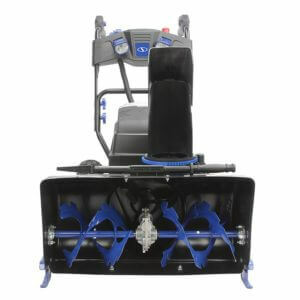 A sing-stage snow blower like the other two you have just read above has the auger makes close contact with the road surface, then collects AND discharges all the snow at the same time. 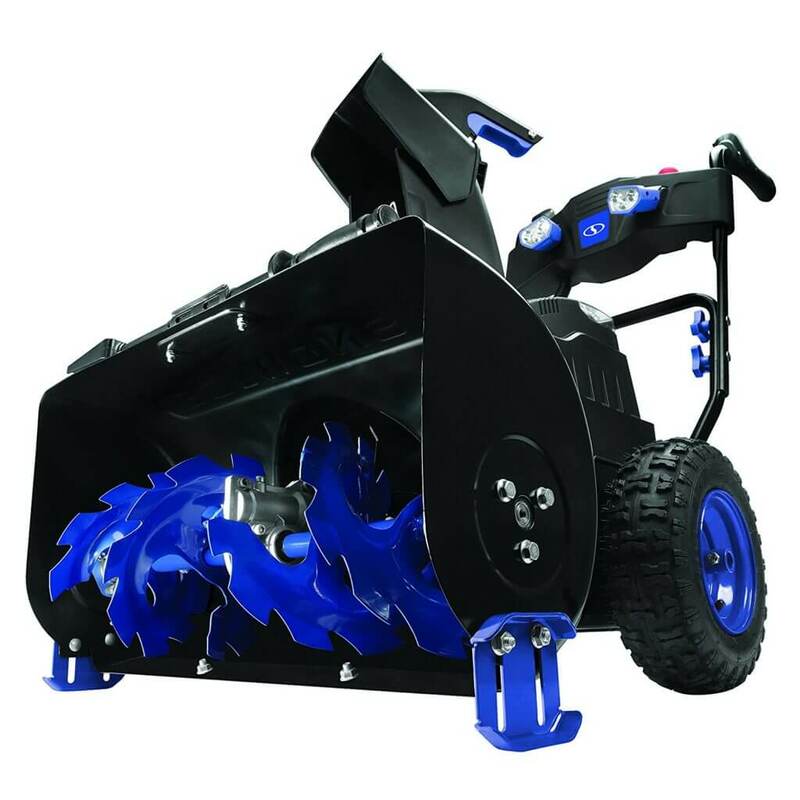 A dual-stage snow blower like this one does not have its auger touches the pavement. The serrated steel auger only breaks and collects snow, then a separate impeller (fan) shreds and blows snow out through the discharge chute. The good thing about single-stage is it does a more throughout job on paved surface, but it will be a challenge on dirt and gravel, or steep sloped driveway. You may even damage a single-stage snow blower this way if rocks and gravel keep getting into the rubber blades. A dual-stage model on the other hand works excellent over rough and gravel surface, as well as steep pavement since the opening bottom is lifted off the ground via the height-adjustable skid shoes (blue parts in picture above). However as you may have guessed, it will potentially leave a trail of accumulation behind and that must be cleared out with a shovel. The good news is, if you have a smooth driveway then there is nothing to worry about. Because you can lower the blower to minimum height and it should take away most of the snow without a problem. And since a dual-stage snow blower is a lot more powerful, it can shoot the snow much further which will save you a bunch of time going back and forth in the same area. 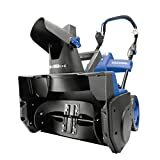 So, if you live in a zip code that often receives heavy snow and your rough, steep driveway is slightly longer than a CVS receipt, this might be the perfect choice of all battery-powered snow blowers here. The self-propelling feature is a seriously a crucial life-saving for your back when the time comes. The drawback is, with all those bell and whistle, you’d lose quite a bit on the runtime. The 2500W motor really gives the two 40V 5A batteries a run for the money. You only have 30 minutes to work the magic, unless you could bid another $300 goodbye for one more set of these batteries. 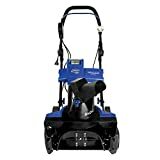 For almost $900 before the extra set of batteries (if you prefer 60 -minute runtime), it will be a tough sell for this machine since gas-engine snow blowers could bring a lot more power to the table for the same amount of dough. Folks who wander often at the orange home improvement store might have seen this unit more than a couple of times. 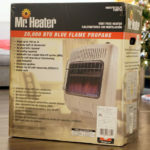 Model that comes with 2 x 7.5A batteries runs for over $800 and another one that has 2 x 5A batteries is north of $600, both prices are from Home Depot at the time of this writing. Someone gotta really explain to me why this thing is so expensive while the features and functionalities are apparently similar to the two single-stage snow blowers we just went over. Upon further touching, I like the EGO Power+ snow blower for its rigid build and a quality feel in all the components. Maybe it’s the color tone but it certainly feels nicer than the Greenworks and Sun Joe models. It also has a compact design where the handles can fold in neatly for storage –similar to Greenworks’ and Snow Joe’s. Another positive note is the EGO Power+ snow blower has a pretty decent battery package. The 56V 7.5A battery itself is huge yet it only takes 40 minute for a full charge. That is impressive and must be the sole reason for the premium cost. The two batteries also drop in their own compartment very securely and last for a long while. Unlike the Snow Joe iON18SB, the battery compartment cover sometimes gets loose off the underlatch and snaps wide open –that is a no-no in the wet and freezing condition these machines supposes to operate under. Fortunately, water was never able to reach deep enough to the electrical contact points inside the Snow Joe iON18SB‘s battery compartment during all of our trials. One other selling point of this snow blower is the unique variable speed adjustment. You can in increase or decrease the steel auger & rubber blade speed which in turn could improve or impact the battery life. And the EGO+’s is the only snow blower that’s backed with a 5-year warranty. Other than that, we find the power and torque is just a tad above to Greenworks’ snow blower since it seems to leaves less of a mess on one single pass. 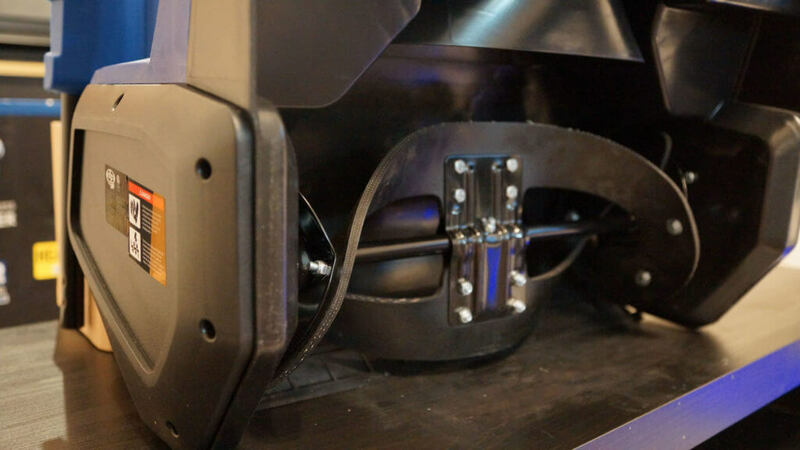 The EGO’s also has 21″ of clearing width which is only behind the big boss Snow Joe dual-stage snow blower, so it can take care of the job a little faster than the other two single-stage snow blowers in this same bracket. 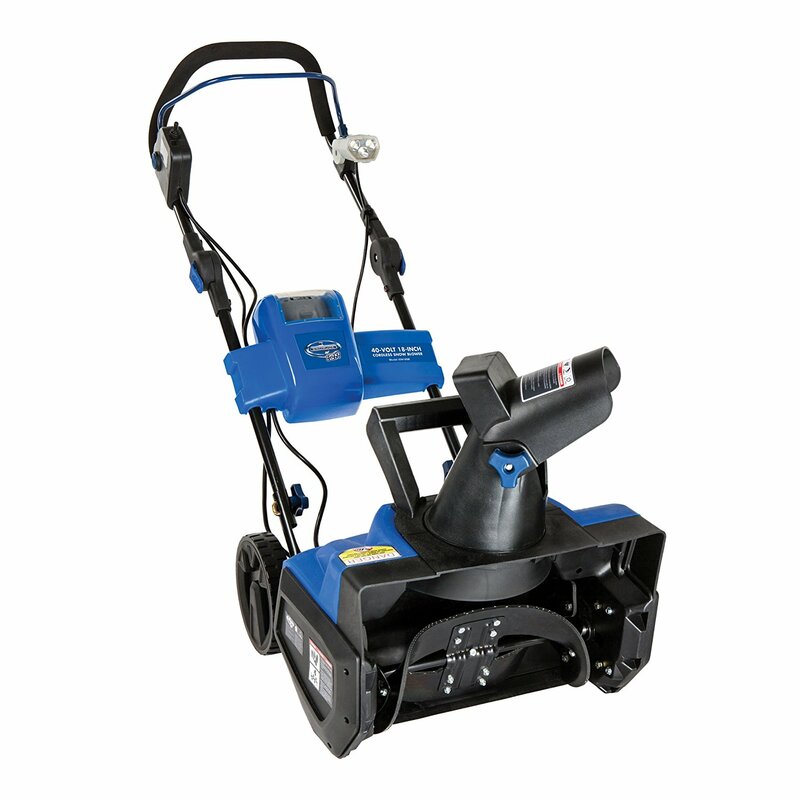 The EGO Power+ 21″ 56-Volt Snow Blower is a decent machine that comes with a heavy price tag. At $600-$900 range, I’d expect a 100% steel serrated auger like the Snow Joe dual-stage snow blower, but instead we only get like 20% steel part and the rest is rubber blades to play with. 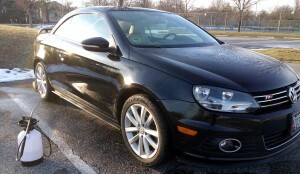 Not very worthy, no Hammer for this machine. But then again, if you are looking for a quality-built snow blower that can charge quickly, has a big clearing width with adjustable power and a long warranty for your 800sqft driveway that sees an average amount of snow fall annually –you might have found the right one. I am still uncertain if EGO Power+ 21″ 56-Volt Snow Blower is a fruitful buy over the gas-engine snow blower at this price range though. So up to your budget (is she gonna say yes?). Good reviews of these specific types. I have a Snow Joe and find it very good.